This engine is based on the latest Kubota V3800 featuring direct injection, with four valves per cylinder and incorporating E-CDIS for cleaner emissions. This is an extremely smooth running, naturally aspirated, high torque engine that is particularly well suited for displacement hulls. This page has a variety of useful downloadable PDFs including the engine Product Brochure, Mechanical Diagram, and Operators Maintenance Manual. Includes specifications, performance charts, engine photos, options, panel photos, and metric mechanical diagrams for engine model BV3800. 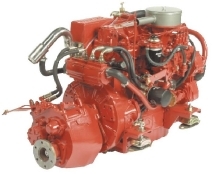 Both US and Metric dimensions for engine models BV3300 and BV3800. Check which transmission and alternator configuration you are specifying. Other diagrams available on request. For engine models BF2803, BV3300, and BV3800.